Library of Mats, in Cubbon Park, Bengaluru, India by Artist/Designer Natasha Sharma. The mats became points of encounter and interaction in the park, an object that revolved around different groups of people at different hours of the day. This intervention then become a proposition on site, giving people control over the purpose of it, making the place more public in nature. 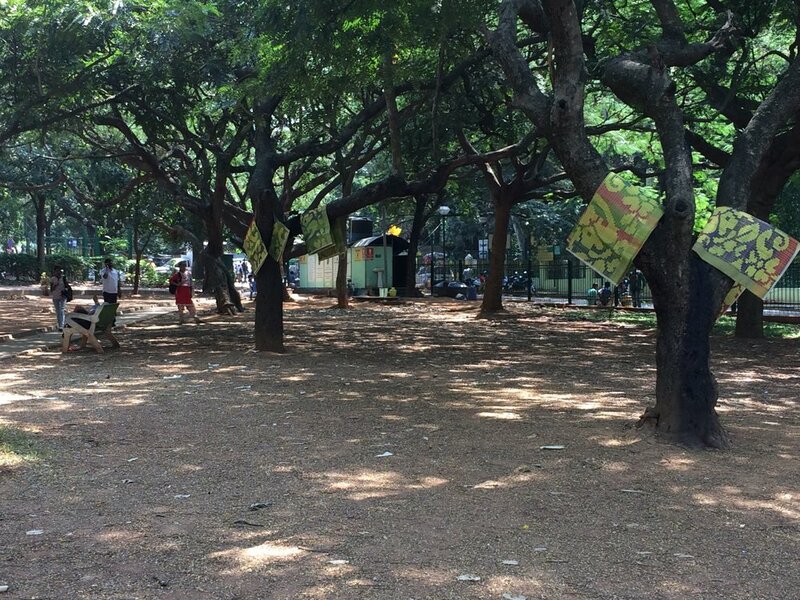 A hundred acres of land, Cubbon Park lies in the heart of the city Bengaluru. Where people from various corners of the city come for rejuvenation, making trips over the week/weekend for picnics, walks and play. 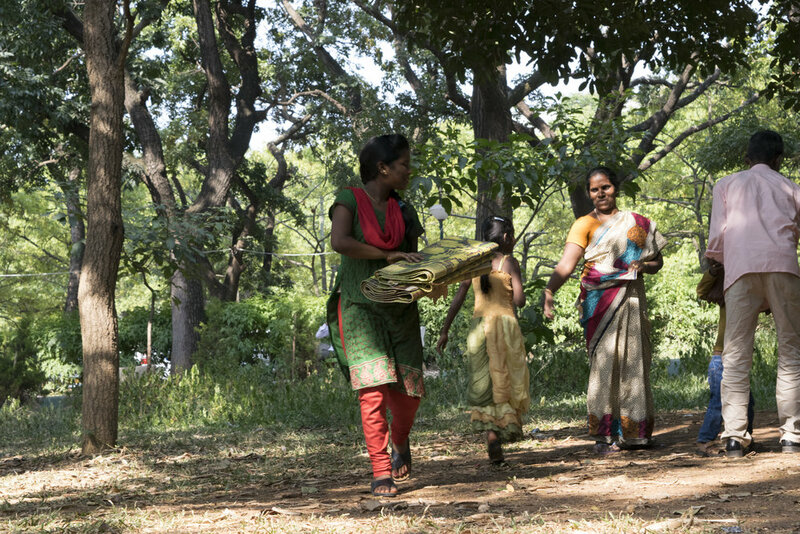 People bring their mats , snacks, games and spend an average of two hours in the park for picnic. This intervention involved installing 70 mats in the park, 4 feet by 6 feet each before lunch time on a Sunday. The mats were regular looking and had no given clue about what one could do with it or what is the point of it. Using trees as shelves, each mat instead of being placed on the ground, were hung or stacked on trees. This not only made the park look unusual but intrigued people to think beyond it and question why and what could be the purpose? Eventually, without any prompt or initiation, people started pulling the mat down and using it. More people started doing the same as they saw other people do it. After observing this interaction repeatedly, it came by surprise to see people putting it back on trees as well. A whole of 70 mats revolved around 120-150 people including families/ couples/ individuals that had come that day for their picnic. A large group of people used these mats as props to come up with games and activities. I intervened as a stranger and asked one of the many people using the mat, why he was putting the mat on the tree, to which he said that he got it from there, and nobody stopped him, so it may belong to the everyone who comes to the park. He offered that I could use it too but just remember to put it back.